The Maritime and Offshore exhibition Sea Asia took place in MBS this week and I was there. It is my 17th year in the industry. I met many old pals, although the number of them still active in the industry has significantly declined. Had many chats and below are some of the key takeaways? The big question: "Has Marine and Offshore Industry Recovered?" I am not too sure if the industry is recovering? But one thing I am certain is “we are still at the bottom of the cycle”. Obviously when you hit rock bottom, the only way next is up! That said, it is unlikely that we will not be anywhere near the glorious days for the foreseeable future. The sentiments from the show is definitely not that rosy in my opinion. News of recent retrenchments and pay cuts are not unheard, and it is very difficult to new jobs. SMEs who survived and still enduring the ordeal, are very cautious with cost overheads. Most are also striving to diversified into other sectors. Many companies which failed to do so, are either liquidated or in process of liquidation. So what if they have decades of solid track records to speak of? Those once glorious local listed O&M companies with hundreds of millions/billions market cap are now languished with hundreds of millions of debts. Many had already filed for administrations or had their shares suspended. The rest are kept afloat because creditors have not much options but to provide more time. I also met quite a handful of retirees who still want to have a sniff of the industry. On the other hand, I did see some old guards back into the industry again either being employed or acting as consultant. This is good news. Big companies are either struggling or some sees opportunity. Either they continue to cut overheads or they merged. Norway’s Kongsberg Group completed acquisition of Rolls Royce Commercial Marine, one of the big names in the industry, for 500millions GBP this month. I have friends in both Kongsberg and Rolls Royce and I am sure they will face uncertainty as mergers always create redundancy due to positions overlapped. MacGregor also announced acquisition of O&M business of TTS Group but completion of acquisition has further delayed due to regulatory approvals from competition authorities. On the other hand, upstream oil such as production side of the business is definitely doing much better. Floating Production Units (FPU) which comprised of FPSO, FSO, FLNG etc. are vessels for producing/processing, storing and offloading oil and gas to tankers. FPSO vessels are often in billions of dollars and chartered over 20 to 30 years. Many FPSO projects were planned in the pipelines with Brazil Petrobras having the most announced. One FPSO contractor with a huge setup in S’pore is Japanese operator Modec being extremely busy flooded with many projects. Other FPSO contractors are BW Offshore, SBM, Yinson, MISC, Bumi etc. Sembmarine and Keppel are basically the shipyards capable to convert or build the FPSOs. Both companies have FPSO orderbooks and are definitely eyeing for more ahead. During the good old days, the sectors that propelled the market to a boom in SG are from Rigs, OSV & Offshore Construction (OC) sectors. E.g. Rigs are Keppel, Sembmarine, Ezion, Falcon, Baker etc; OSVs are Nam Cheong, Pacific Radiance, Swissco, Marco Polo, Vallianz etc; Offshore Construction companies were Swiber and Ezra in which both filed for administrations. To understand more about the different sectors within O&G, please refer to my blog in March 2014 here. These sectors are definitely still very much battered with huge oversupply. While there are few Drill rig orders lately, buyers dictates the margin and terms. Furthermore, contracts are often on the basis that Sellers have to finance a big part of the sale for the Buyers. OSVs are without questions the worst of the lot with huge oversupply. Many vessels are still lying unfinished mostly in Chinese shipyards. Charter rates of OSV in most cases cannot even cover basic cost. Companies who are still with decent jobs are normally those with country’s protection or special relationships. Vallianz is one of them which is still busy with jobs thanks to their Saudi owner. Most of their vessels are operating in the Middle East region serving Saudi Aramco. Then there are companies with vessels serving Indonesia market which is with local content. But even so with jobs, margins are battered because supply exceeds demand. Many O&M companies also look to diversify into sectors independent of oil and gas or with projects related to technologies or “environmental friendly”. For instance, port developments will require Dredgers, Tugs and Barges. Keppel announced recently that they received grants from MPA for the development of an autonomous tug. And I also heard from friends that this is the sector where they still managed to sell. However, the value of tug boats are very small compared to OSVs or Rigs or OC. The Dredging vessels are bigger in value compared to tugs and barges. This sector however is very niched and dominated by few companies, which essentially meant that new players often had to pay school fees of learning. Keppel has already forayed into this sector with few wins since 1-2 years back. Many other companies also want to have a bite of the pie. Renewables sectors such as Wind especially in Taiwan and LNG sectors are also generating a lot of interests. But bearing in mind that these sectors are more niched and also many players are swarming in with limited projects to satisfy everyone. Renewable sectors are also dependent on Government regulations and hence progress will always be very much slower. Thus driving out many smaller players who are not financially strong to wait so long for a project confirmation. The world also see a rise in internet data. And the most efficient way of data transmission is laying of submarine fibre optics cables. Therefore Cablelay of Fibre Optics is definitely a viable business looking forward. Again these are sectors with lesser and niched players and volume of business is also not as big as Rigs and OSVs during the heydays. The O&M industry is at its rock bottom. It was the worst ever three years since the Oil downturn. Oil price is still unstable. Last year, oil price was mostly above $60 and everyone started to be more positive until in Dec when it tumbled below $50 spoiling all good sentiments. Hence, banks are still cautious in lending or totally not lending at all. When financing is tight, not many companies can afford to invest in new projects using self-funding. The lack of investments spiralled down the value chain which explains why the industry is still in distress. Nonetheless it is not gloom and doom. Many reckon that the worst of the downturn is behind us in upstream oil and gas. The pro-longed downturn cannot go on forever and upstream oil and gas still need to invest, and banks still need to lend. Companies or workers who are still in the industry today are likely to represent those who are more resilient forming the backbone of the sector. If oil price stables or steadily increases this year, I am sure confidence will rise and activities will increase. Besides, we already seen many projects sanctioned in the FPSO sectors. For me, I am in a strangely positive situation where we still see growth in the sectors we operate in. Perhaps it is due to the niche in our product offerings and our core business is not all oil and gas related. I thank God for that and really hope that the industry will recover soon. My prayers extend to all those who suffered within the industry. Renew Car COE 5 years or 10 years? Over the last 15 years, I had several different cars registered under my name. They are either new or used-cars from 1.5L to 2.5L, from Japanese to continental cars and from sedan to MPV. No posh cars though. Cannot afford. I had also rented cars for few months, and even had experience of selling cars in the old days. That said, the one experience I do not have, until recently, is the renewal of car COE. Last week, I renewed COE of my Toyota Estima. Initially I opted 5 years, but a friend of mine gave the rationale why 10 years is better if you can afford the COE upfront. I will explain why but before that you need to understand how COE works, what is Minimum PARF value, and what is Prevailing Quota Premiums (PQP). You can also find out more information @ www.onemotoring.com.sg. Basically, if COE is 30K for 10 years, if you decided to deregister your car at year 5, you get back 15K and at year 6 you get back 12K. So, it is a pro-rata basis costing 3K p.a. If your car is still within 10 years, it is a PARF car. If it is more than 10 years, it is a COE car. You can read here what is the difference between PARF and COE car. E.g. a car has a PARF of 15K, if you decide not to renew COE, you take 15K back. If you decide to renew COE, you will have to forsake this 15K. PQP is the moving average of the COE prices in the last 3 months and varies from month to month. Below is the table showing PQP of COE. My car 10 year period expires in mid-May, so I am allow to choose either PQP for March, April or May. You can see that there are differences in pricing. I am lazy to wait for May PQP (Cat B) to be out and quite sure it is going to be >35K, hence I chose the cheaper PQP in March which is 33K compared to April one which is 35.4K. So, 5 years or 10 years? I opted for 10 years COE. Let’s see the advantages and disadvantages. Using my car 2.4L Toyota Estima as an example, i.e. PARF 17.6K, PQP 33K. I am paying 17.6 + 33 = 50.6K for 10 years. This means that annual depreciation is about 5K for the car. I am paying 17.6 + (33/2) = 34.1K for 5 years. This means that annual depreciation is about 6.8K for the car. 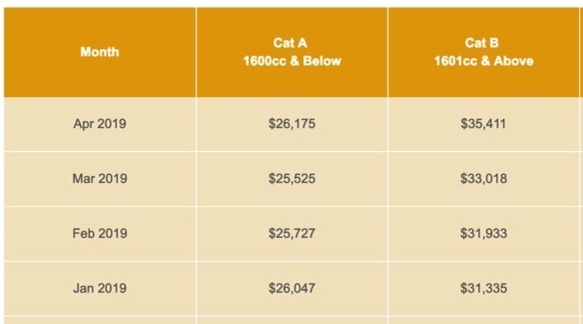 So we can see that 10 year has cheaper annual depreciation of 1.8K. This is because the PARF is spread over 10 years rather than 5 years. Of course, you have to take into account road tax and insurance of older cars are more expensive. 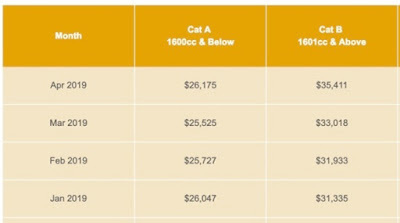 Basically, there is an annual road tax surcharge for COE car as per table below. And also, the maintenance cost for an older car is usually more expensive due to wear and tear. 5 years surcharge is 2,530. P.a. = 506. 15-19th year = 1,682 + 842 = 2,524. 5 years surcharge is 4,210. P.a. = 842. Therefore road tax difference of S$336 p.a, if you continue to drive the car after 5th year. If you opt to renew COE for 5 years, once it expires, you any time you decide to de-register your car and get back the COE pro-rata rebate, you can! This is the reason where my friend explained to me and why I decided to renew for 10 years. For 5 year COE car, let’s say I driven for 2.5 years and sick of the car, I decide to sell. The car is only left with 2.5 years COE. It will be very difficult to sell, because buyer will go for newer COE car which depreciation p.a. is almost the same price. And also poorer family may want a COE car that they can drives longer years with a lower annual depreciation. This means that you will likely need to de-register your car rather than sell your COE car. Then the PARF you forsake will be more pricey because you only spread it over a period of 2.5 years other than 5 years. If your COE is 10 years, then after 2.5 years, your car still have a life span of 7.5 years. 10 year COE : 50.6K. Hence, depreciation is 10.3K p.a for the first 2 years if you de-register. If you try to sell, it is quite likely that you will not find a buyer, because it is left with 2.5 years and depreciation is impossible to be cheaper than 6.8K where we initially calculated. In retrospect, for the 10 year COE, after 2.5 years, I am likely able to sell because the COE still have a 7.5 year life span and the depreciation is cheaper at 5K plus. I opted for 10 year COE for the reason that lower p.a. depreciation if I were to drive more than 5 years. And also possibility of selling is higher if I were to sell it mid-way. The only disadvantage is I need to have 16.5K more upfront. But at any point of time, if I de-register my car, the amount of COE I take back is always pro-rata. So renew COE for 10 year if you can afford it!